The size, shape, and color of Grand Canyon National Park combine to leave an impression on visitors as deep as the canyon itself. 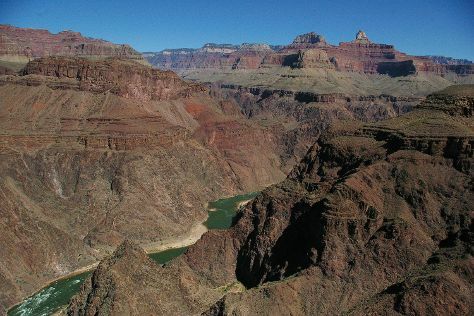 The powerful Colorado River formed the brilliant red canyon over millions of years, leaving behind a chasm as wide as 29 km (18 mi) and as deep as 1.6 km (1 mi). Ninety percent of visitors take in their vistas from the more accessible South Rim. Views from the less-crowded North Rim are reserved for those who either drive 354 km (220 mi) around the canyon or take the two-day hike down the south side and up the north side. Backpacking, pack mule trips, and river paddling, in addition to hiking, all offer views of the canyon from below. With eyes transfixed on the massive, colorful chasm, it can be easy to miss some of the 373 species of birds, including bald eagles, here. Grand Canyon National Park is in Arizona (AZ). Use our international travel planner: Grand Canyon National Park and all its delights await.